Get Personal Guidance from a Local Medicare Agent! ﻿Get answers and avoid confusion, worry and often expensive mistakes involved in choosing a Medicare Advantage or Medicare Supplement Insurance Plan by yourself. We do all the research and hard work, so you can get a clear, concise view of real and comparable costs, such premium, deductibles, copays and coverage limits. Watch the Video: CLICK HERE!! A Medicare supplement (Medigap) insurance, sold by private insurance companies, can help pay some of the health care costs that Original Medicare doesn't cover, like copayments, coinsurance, and deductibles. Medicare Pescription Drug Plan (Part D). These plans (sometimes called "PDPs") add drug coverage to Original Medicare, some Medicare Cost Plans, some Medicare Private Fee-for-Service (PFFS) Plans, and Medicare Medical Savings Account (MSA) Plans. 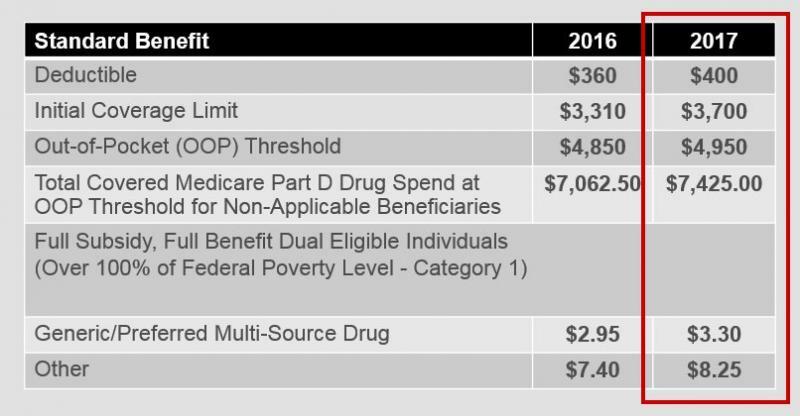 ﻿﻿2018 Prescription Drug "Standard Benefit"
Here the highlights for the CMS defined Standard Benefit Plan changes for 2018. The "Standard Benefit Plan" is the minimum allowable plan to be offered. In 2018, Part D enrollees will receive a 65% discount on the total cost of their brand-name drugs purchased while in the donut hole. 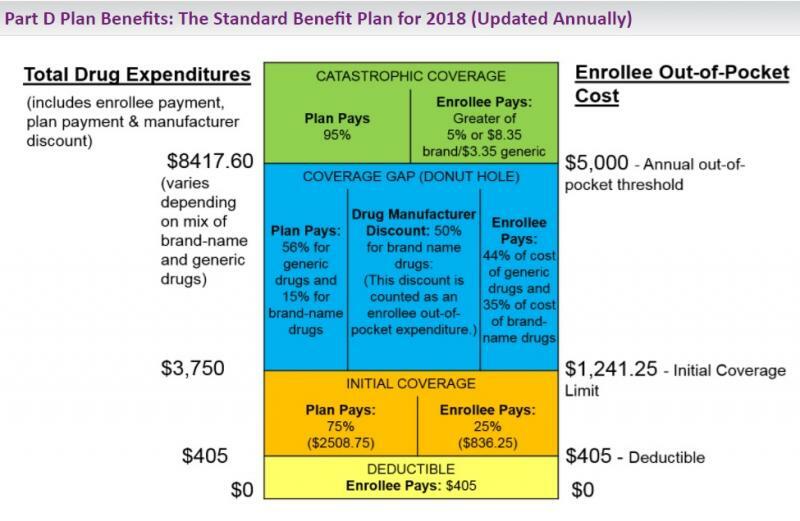 The 50% discount paid by the brand-name drug manufacturer will still apply to getting out of the dunot hole, however the additional 10% paid by your Medicare Part D plan will not count toward your TrOOP. Enrollees will pay a maximum of 44% co-pay on generic drugs purchased while in the coverage gap.